Patrick Idringia aka Salvado plays with children at Angel’s Centre for Children with special needs in Wakiso. Photo by Paul Ibanda. It is true that giving is not just about a donation but making a difference in someone’s life. Children at Angel’s Centre for Children with special needs in Wakiso will have a brighter Christmas this year because Santa Claus appeared earlier in form of standup comedian Patrick Idringia aka Salvador. During the preparations for his Singleton sponsored Man from Ombokolo 2 (MFO2) show held in October at Imperial Royale Hotel, Salvador pledged that a percentage off every ticket purchased would be given to support less privileged children. With mouths filled with saliva dripping all the way to their t-shirts, some lying helplessly on the floor unable to move and others moving all over the place with no understanding whatsoever of what was happening, Salvador danced, carried and played with the children during his visit to share with them gifts for Christmas. Together with his girlfriend DaphineFrankstock and friends, Salvador gave Angel’s Centre food stuff and Shs1.5 million to see them through the festive season. “I have heard that some of these children are dumped because of their condition and I wondered how I can make a positive impact in their lives,” Salvador said. 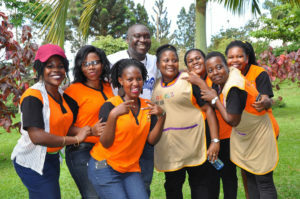 Salvado poses for a picture with some of the staff at Angel’s Centre. Photo by Paul Ibanda. Angel’s Centre for Children with special needs provides rehabilitation, early childhood development, training and support to children and parents with children with special needs. It takes care of children with Cerebral Pulse, down syndrome and many other physical and health challenges. Angel’s Centre was started by Rose Nambooze Niwagaba six years ago after she gave birth to a son with a heart problem, narrow throat and hearing impairment. She discovered that there were a number of women who’d given birth to children with special needs but didn’t know where to get special attention. Through his foundation called Dawa, Salvador pledged continuous support to Angel’s Centre which he requested to accept him as part of the family and welcome him anytime he comes by to play and spend time with the children. This is not the first time Salvador is donation to children with special needs. Together with his girlfriend Daphne and members of his MFO2 team, Salvador gave to the Home of Hope, a centre for children with severe or multiple disabilities in Jinja; during the preparations for his show.